Henry Williamson (1895-1977), nature writer and novelist, remains best known for his nature stories set in North Devon, and particularly the much-loved classics Tarka the Otter and Salar the Salmon. Between 1951 and 1969 he published his great work, the fifteen-volume novel sequence A Chronicle of Ancient Sunlight, the story of Phillip Maddison. While he was writing these he was also continuing to write short pieces for newspapers and magazines. 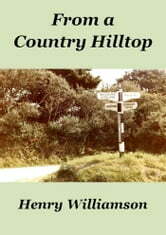 From a Country Hilltop is a collection of 58 such essays written between 1958 and 1964, which were published in the Co-operative Society’s Home Magazine and, in its Out of Doors series, the Sunday Times. The ‘country hilltop’ was his haven, the field at Ox’s Cross in North Devon that he had bought after the success of Tarka the Otter, and where he had built his writing hut. These short essays – personal musings on life, his children, North Devon (now known as ‘Tarka Country’) and other subjects – show HW’s descriptive powers at their best. Nowhere is this shown better than in ‘The Last Summer’, a longer piece that is an evocative personal re-creation of the last golden summer of 1914 before the outbreak of the First World War and life changed forever; it was published in 1964 in the Sunday Times Magazine to commemorate the fiftieth anniversary of the beginning of the war.